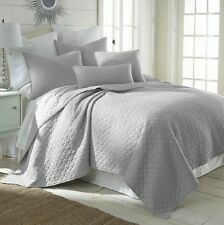 New 3 Piece Quilt / Bedspread / Set with 2 Pillow Shams embroidered. Quilt include 2 Pillow Shams. Size :quilt : 92 x 94" Do not bleach. Sham: 20 x 30" each. Machine Washable. VERA WANG PUCKERED DIAMOND. QUEEN COVERLET. 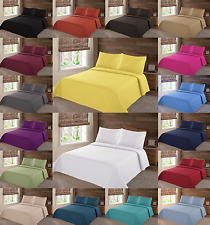 EGYPTIAN NENA SOLID QUILT BEDDING BEDSPREAD COVERLET PILLOW EVERYTHING MUST GO! This cotton-blend quilt features an overall chambray texture. SIMPLY SHABBY CHIC. from Simply Shabby Chic. 1 King Lily Rose Quilt. This king quilt is crafted from an ultra-soft fabric with 200-thread-count cotton. 100% COTTON. COLOR WHITE. FITS MATTRESS : 60 X 80 IN. 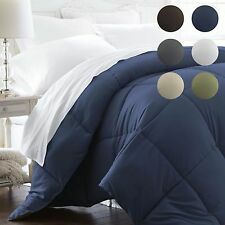 Full/Queen Coverlet Agate Ivory Bedspread Quilt. FILL : POLYESTER. 94 IN X 96 INMATERIAL CONTENT . Give your bedroom a cozy, contemporary makeover with the UGG Solstice Coverlet. Diamond-shaped quilting adds plush texture to the yarn-dyed cotton flannel bed topper. Sherpa lining on the reverse provides lightweight warmth during cooler weather. Fabric: viscose/cotton, reverses to cotton; cotton fill. It has three layers of recycled sarees stitched together with thousands of small & delicate fine running Kantha stitches, Hand crafted softly quilted handmade by artisans in India. It is an old age tradition in rural India to recycle used old sari for making quilts/throws. New ListingVintage Matelesse White Bed Cover Coverlet Rose Buds Poly-Blend Fabric 88" x 93"
Very good condition previously owned TWIN MATELESSE BED COVER in a sweet rose pattern. Old fashioned cottage charm. No defects or flaws noted. Polyester-cotton blend fabric, medium weight. Scalloped border. Measures approx. 88" x 93" All of my bedding items are presoaked in oxyclean to remove any dullness or residue. It is then washed, double-rinsed, dried and packaged. IT IS CLEAN AND READY TO USE. Thank you for viewing and please feel free to contact me if you have any questions or comments. ANJA KALAMKARI PRINT. Lush floral motifs form a beautiful Kalamkari pattern on our Anja Quilt. This set is amazing - simple yet elegant and outstanding for your bedroom this year. Incredibly soft cotton and very versatile. West Elm Organic Queen Quilt Bed Sheet. Condition is Pre-owned as it was washed once. Shipped with USPS Priority Mail. Purchased last winter new from west elm but only washed once. Living in the south it never gets very cold, this remains in the closet. Smoke free home. Please let me know if any questions. The wool in our quilts are carbonised which results in an 'odour free' quilt. Our premium quality quilts are all Australian made from all Australian wool. They are quilted in the 'diamond stitch' design which makes them superior to other wool quilts. These Exclusive Quilt is Handmade with beautiful pattern, This Kantha Bedspread Floral pattern. Enhance existing beauty of your living space with these traditionally handmade kantha stitched Bedding Sets. Give your room a streamlined look with the Garrison Stripe quilt from Martha Stewart Collection. Includes: 1 Martha Stewart Full/Queen Quilt. Color: Grey. Colors: ivory and grey. Machine washable. 100% Cotton. New ListingAdorable! Shabby Chic Pink Yellow Green Embroidered Flowers Quilt 68" by 80"
Quilt is very thin, probably unlined. New Listingpaisley handmade quilt black gray green and white New 68 x 56 Beautiful ! Handmade paisley quilt all new materials. Made in Portugal. Machine washable. Color: white. SIMPLY SHABBY CHIC FULL QUEEN QUILT. Fill:100% Cotton. Face fabric: 55% Linen/45% Cotton. Back fabric: 100% Cotton. New ListingVintage Kantha Quilt. Sundance Kantha Throw. Reversible Twin Bedspread. These Kantha quilts are hand stitched from recycled sari cloth from Indian. Kantha refers to the type of stitch that gives the sari quilts a wavy texture.The rural Indian kanthas are offered to guests as a seat, a place to rest tea, or simply an expression of welcome into the home. No two vintage kantha quilts are the same. There are imperfections and wearing that add to the uniqueness of each quilt. The artisan’s skills of reviving and recycling these imperfections is what turns each piece into a unique one-of-a-kind collectors piece.These quilts are reversible with two completely unique designs.They are made of 100% cotton and measure 80x50 inches. STURDY MACHINE QUILTED FLOWERS, FLOWER BASKET PATTERN COTTON QUILT AND ONE LARGE SHAM NEVER BEEN USED. ABOUT 82" WIDE AND 112" LONG. QUEEN SIZE. SCALLOPED EDGES BROWN FLORAL BACKING. BRIGHT ALL COTTON VERY DECORATIVE COVERLET. New ListingNWT HANNA ANDERSSON COTTON DAYTRIPPER RAINY DAY CARS QUILT TWIN $149 NEW! HANNA ANDERSSON. THIS IS A GENEROUSLY SIZED, LIGHTWEIGHT QUILT. PATTERN OF CARS AND MOTORCYCLES WITH RAINCLOUDS. PREWASHED SOFT COTTON WITH 100% COTTON FILL. These Exclusive Quilt is Handmade with beautiful pattern, This Kantha Bedspread Birds & Floral pattern. Enhance existing beauty of your living space with these traditionally handmade kantha stitched Bedding Sets. It is inspired by a relaxed lakeside retreat. Size - Twin. Condition - NWT. You will be, when you lie amongst the roses in the luxuriously decadent Pioneer Patchwork quilt. Radiating chic sophistication from every angle, its bright, airy look and feel will add charm to your sleep haven, quickly making it the most comfortably chic room in the house. Coverlets, bedspreads, and quilts are 3 different types of bedding. They can come in a variety of sizes and materials. Many are available in sets, solid colours, or patterns. They serve various purposes and are suitable for all seasons. A bedspread is a generic name that is given to bed covers that are meant to be the top layer on the bed. Different types of coverings, such as comforters, quilts, and coverlets all fall into this category. These coverings can be heavy, light, thick, or thin and can be made from various kinds of fabrics. Traditionally, quilts are created with 3 layers. These layers include a cloth top, a layer of batting, and a woven back. All of these layers are stitched together to create unique and decorative patterns. Unlike other types of blankets and comforters, quilts are usually produced by putting together many pieces of cloth. Over the centuries, quilts have been used to mark important life events, as decoration, and as warm and beautiful bedding. Coverlets are bedspreads that are lightweight and either woven or quilted. They are typically thinner than comforters as they have a thinner layer of cotton batting. Coverlets are usually used as throw blankets on beds and couches or as a stand-alone bed covering. Coverlets tend to err on the simple side and are shorter than other coverings, but they have great decorative quality. 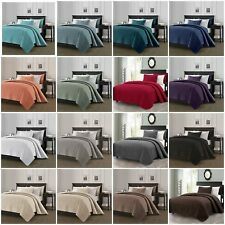 What sizes do bedspreads come in? Bedspreads can be found in various bedding sizes, such as Twin, Twin XL, Full, Queen, King, and California King. General bedroom coverings like comforters and quilts will have measurements that measure longer than coverlets, as they are designed to cover the entire bed. Coverlets are typically only designed to cover the top of the mattress. Generally, bedspreads for a Twin mattress measure roughly 81 by 96 inches while a coverlet for the same bed will measure 71 by 91 inches. Queen-sized bedspreads and quilts measure 102 by 101 inches while coverlets measure 92 by 96 inches. What materials are bedspreads made of? Quilts, bedspreads, and coverlets can be made from many kinds of materials. Cotton is the most basic fabric. Warmer fabrics such as flannel and fleece can be added for warmth. Some bedspreads use less material, while others use more cotton batting to add additional weight. Newer technologies have even allowed coverings to be heat-producing and temperature-controlled as well.